Sen. Rand Paul (C) (R-KY) takes a brief break from the floor of the U.S. Senate to pose for a photo with Rep. Justin Amash (L) (R-MI) and Rep. Thomas Massie (R) (R-KY) at the U.S. Capitol February 8, 2018 in Washington, DC. Paul is blocking the U.S. Senate from voting on a spending package reached yesterday to avoid a government shutdown. 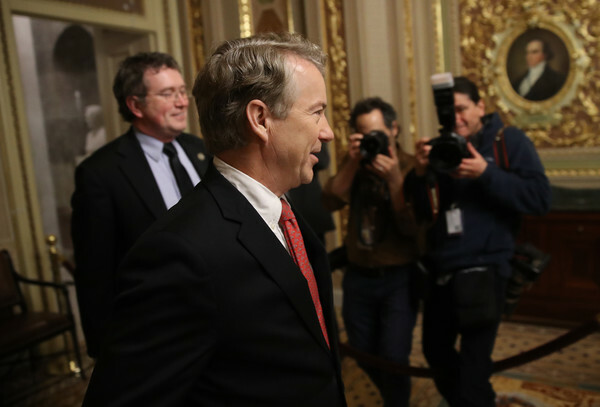 Paul is demanding that the U.S. Senate vote on an amendment that would cap spending.